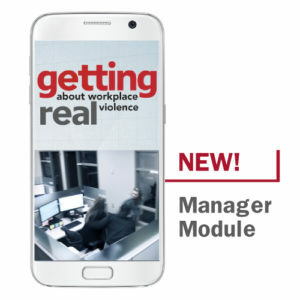 New Training Program About Workplace Violence Prevention Released | Prositions, Inc. New Training Program About Workplace Violence Prevention Released | Prositions, Inc.
Prositions, Inc. announces the addition of a new manager training module to Getting Real About Workplace Violence. This expanded program now includes specific information and examples for managers and supervisors to recognize the early warning signs of potential workplace violence and threats. The entire Getting Real About Workplace Violence training program aligns with the American National Standard—the guidance published by ASIS International and the Society for Human Resource Management (SHRM) for best practices addressing workplace violence prevention and response. The new advanced manager training is included in the comprehensive course package that contains 26 minutes of high-quality video and reproducible training materials. The program is broken down into three modules: Awareness (10 minutes), Prevention & Response (8 minutes), and Manager’s Role (8 minutes). Getting Real About Workplace Violence is available in classroom, eLearning, and micro-video formats. To request a free preview of the full program, please call (515) 864-7200 or visit: https://prositions.com/getting-real-about-workplace-violence-active-shooter-training/.